Your feet are closer to average in length and width than you think. By those two dimensions, you are a size 9.5W, not even an extra wide. The flat arches and the orthotics are the challenges. There are several brands that make styles with removeable inner soles which allows your orthotics to take up the space designed for the inner sole and makes a better fit. Soft Spots and some Naturalizers offer this feature, for example. But let’s assume you don’t remove the inner soles. 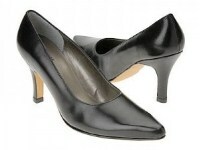 Women with flat arches tend to find that the edges, the “throatline” of their shoes gap. I recommend, for this reason and so you can test different widths, wide or extra wide, that you look at “Mary Jane” style pumps. These shoes designed to have a strap over the top of your arch. 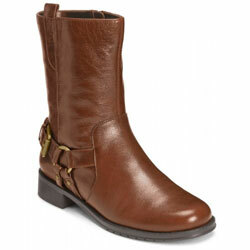 Take a look at some of these Mary Jane shoe styles. They come in wide and extra wide widths.